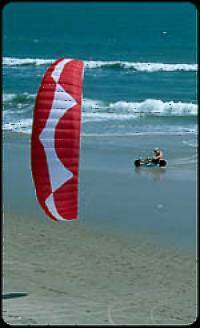 Kite Buggy Help, choosing the right buggy, kite buggy information. A buggy or "Paracart" is a land based wind vehicle that usually consists of 3 wheels, one in the front usually used for steering and two wheels in the back to give the buggy stability. 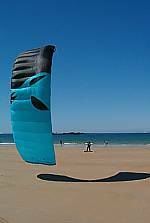 Buggying is the most popular form of power kiting today, followed closely by kite surfing and kite boarding (snow and land). Buggy's are generally the easiest to learn and are the fastest kite powered vehicles on earth. Buggy speeds have been recorded over 72 mph and a typical buggy run on a hard packed surface can easily reach speeds of 30+ mph. With very little resistance and quick agile turning, the buggy can be one of the most enjoyable forms of kite powered vehicles around. 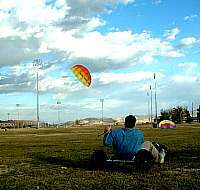 There have been a lot of different variation of the kite buggy since Peter Lynn introduced it over a decade ago. Buggies specifically designed for high speed have been introduced, two wheeled (bike) buggies are now emerging, along with many different designs and ideas that have spawned from the original buggy. The Peter Lynn Comp buggy is still the most common buggy on the market and is also one of the most affordable. It has also gone through many stages of improvements over the years as well as bringing different models to the market. Thanks to Peter Lynn's innovations, kite power has infiltrated many new markets including mountain boarding, kite skating, snow boarding and kite surfing just to name the most common ones. As mentioned above, it all started with the Peter Lynn buggy which has evolved over the years and is now called the "Peter Lynn Competition Buggy" or "Comp Buggy". The Comp buggy is the most common buggy around, most if not all kite buggy pilots either own or have owned or at least ridden in a Comp buggy. Since the introduction of the Comp, the Folding buggy and Big Foot buggy have been introduced. The Folding buggy is a modified version of the Comp buggy that folds down into itself for transport and will actually fit in a standard sized trunk. No tools are necessary to collapse the buggy and it folds up or sets up in less than a minute. The Big Foot is also a slightly modified Comp buggy. The Big Foot gets its name from its oversized tires that make it ideal for soft sand, soft beaches, or wet surfaces. 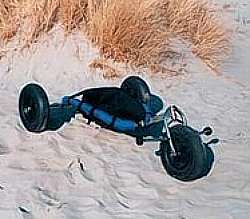 The larger "balloon" type tires on a Big Foot buggy make areas that would not be usable by the original Comp buggy into an outright paradise. Big Foot buggies usually have larger diameter side rails and reinforced down tube. In 2002 Peter Lynn introduced another buggy into the line up. The Comp XR buggy is a totally upgraded version of the Comp buggy with larger side rails, larger down tube, stronger rear axle, larger axle bolts, side pads with colored covers, and a deluxe seat with built in adjustable back support. Race buggies are buggies that usually have extended rear axles and longer side rails for added stability and some of the more expensive versions have adjustable active suspension. Libre is one of the leaders in high end full race buggies and is the buggy of choice for many professional race pilots. The Libre buggy is built for high speeds and is extremely stable and durable. The full race Libre buggy even has an adjustable suspension. Cameleon is another manufacturer that builds a very nice high end buggy. Both the Libre and the Cameleon weigh about twice that of a Peter Lynn XR buggy, an added bonus for high speed racing but can be troublesome for transporting. Flexifoil has also entered into the buggy market and produces a very nice good quality buggy. The Flexifoil buggy has higher side rails than the Comp buggy which allows for a slightly larger seat and very good back support. How to select the right buggy. Selecting the right buggy mostly depends on the conditions in which you buggy on and what your ultimate goals are. If your area mostly consists of soft sandy beaches that can become muddy or wet during the tides you would be best with a Big Foot buggy. It is possible to fit Big Foot tires and wheels onto an original Comp or XR buggy as well as a Libre or Cameleon or most other buggies on the market. Some buggies may require you to change out your front fork to accommodate the larger Big Foot tires. This is an option for some of the comp style buggies but it can add up to more money than just purchasing a Big Foot buggy already set up. If you are looking for the ultimate speed, then you will probably want to look into the line of Race Buggies. Race buggies will give you the best ride and the most stability at higher speeds. If most of your buggying is going to be done in local parks or other semi-restricted areas then you will probably want to look into the Comp style buggies (Comp, Comp XR, Flexifoil). The Comp style buggies offer the greatest agility and are perfect for driving around obstacles. If you plan on doing stunts and free style type maneuvers then the Comp style buggies are the ones you want. Their lighter weight and shorter wheelbase makes them ideal for two wheeling, slides, 360's, reverse riding, and even jumps. Check out the areas you can ride or are planning on riding, if possible try to see what buggies other riders are using. Ask them what they like or dislike about their buggies and the area they are riding and the area you are planning on riding. Ask them if you can try their buggy to see if you like it. Talk with your local kite shop to see what other people are riding and where they are riding. Check to see if there are any restrictions on the area you are planning on riding at. If at all possible, ask to demo the different types of buggies before purchasing. With proper research you will end up with a buggy that will give you years of enjoyment. Buggies can travel in excess of 30 mph pretty easily under normal conditions. Those speeds can be dangerous in a full bodied car that does not have brakes but can be even more dangerous or even fatal in a kite buggy with your backside only inches above the ground. As stated above, buggies have been able to reach speeds in excess of 70 MPH and out here in the middle of the desert with our vast hard packed dry lake beds, reaching a cruising speed of 45 MPH is very common and can really put the icing on the adrenaline rush. Even simple darting around with speeds under 10 MPH can give you injury if you are suddenly hit with a big gust and are pulled from your buggy, speeds higher than that will increase the danger. Whenever you buggy (or anytime you fly a large traction kite) you need to be in constant control and make sure you have all the necessary safety gear in the event that things get out of hand. Always check your local weather patterns and forecast for the day(s) you are going out buggying. Take notice of any storms that may be blowing into your area and the time those storms are predicted to arrive. Always keep an eye out for the weather, watch the sky and surrounding areas for any changes and be prepared for those changes. If you are ever wondering if it is safe to launch your kite, it probably isn't! Be cautious at all times, if in question get a smaller kite out first, try it and then you can decide if the size is too small or just right for the conditions. It is always better to have a smaller kite than needed than to abruptly find out that the kite you just launched (and that just launched you) was too big. Along with the size of the kite and the weather, you have to always protect yourself as much as possible. Always buggy with long pants preferably denim or other strong material. Always use a helmet! Having an OBE (Out of Buggy Experience) can toss and flip you in many directions and sometimes the buggy comes along to make matters worse. A helmet will protect your head when the buggy comes crashing down on top of you or your head somehow finds a rock or hard packed surface on the ground. Knee pads and elbow pads also help keep the skin in those areas attached and not skinned off. Know the area you are buggying at, especially any ruts, ditches, trenches, holes, brick walls, fences etc... Hitting any of those obstacles never works out very well and can cause serious injury (think large rock and your hind end only inches off of the ground - then add in 20 MPH). Anyone who had had a severely bruised tail bone is sure to cringe at that one. Remember, the buggy usually doesn't have any brakes. Don't run head on into another buggy, brick wall, fence, car, etc... always leave plenty (yes plenty) of room to slow down and stop. Buggying is an extreme sport if you want it to be or it can be a very relaxing leisure ride, both of these styles of riding involve a powerful kite that can pull you along. In normal winds the danger is very minimal but the winds can change very quickly and without much notice at all, making it a dangerous situation if you are not prepared for it. Buggy safe and you will have many many years of enjoyment.